Telling the stories of the independent builders of railroad cars in North America from the very earliest days of wooden cars, through the transition to metal cars and onward to the present, with emphasis on the more than 200 builders of wooden cars before and into the early twentieth century. From their beginnings in the first decades of the nineteenth century, America’s railroads multiplied and grew, until by the last decades of the century America was crisscrossed in every direction. A few railroads built their own cars, but the vast majority were built by independent car builders. The story of these builders parallels that of the railroads: from a handful in the early decades of the nineteenth century to hundreds during the last decades of the nineteenth century. Iron technology was in its infancy and its ore scarce, but woodworking was familiar and the supply seemingly inexhaustible. 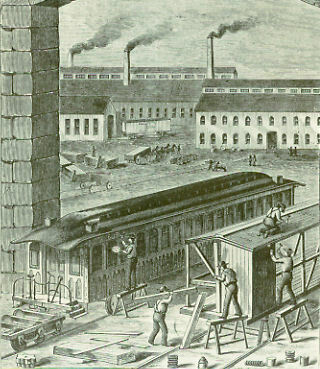 The independent railway car builders active during the wooden car era came to that business from almost every conceivable occupation that dealt with wood: lumbering, sawmilling, millworking, general construction, wagon and carriage building, building of cabinetry and/or fine stairways, bridge building and ship building. Some began with shops so small a single car wouldn’t fit entirely inside, while others began with large multi-building facilities completely laid out in advance. Some quickly went broke, while others succeeded beyond their founders’ wildest expectations, continuing to build cars well into the steel car era. As metal became used more and more in every aspect of American life, the railroads continued to use wood. It was plentiful, the technology of woodworking was widely known and practiced, and best of all, it was cheap (at least in initial cost). But gradually, beginning just before the turn of the century, railroad car builders began to see advantages in iron and steel. They tried to “sell” the railroads on these advantages, but the railroads continued to like the three advantages of wood. Eventually several coal-hauling railroads—that just happened to be related to big steel—saw the advantages of steel hopper cars and began to order them. Once the camel got its nose into the tent, so to speak, demand expanded and spread to other types of cars, especially passenger cars, which could now be advertised as “fireproof” (fire being a common hazard of riding a passenger car on America’s early railroads). By the 1930s wood was used only in the sheathing of freight cars, and by the 1950s, even that had ended. The list below shows builders currently represented. It you have information on one that isn’t here, let us know; we’re constantly adding more. If you have contributions, comments, criticisms or corrections—especially corrections—please click on the guy in the hammock below to send us an e-mail. We’ll gladly roust him from his slumber and put him to work! Brinkley Car & Mfg. Co. This website is for educational and modeling purposes only. We sell nothing. If any commercial enterprise is mentioned, it is because we have found it helpful: we receive no benefit of any kind for doing so. This website is always in transition. If you don’t find what you want, bookmark it and come back later for another try. Or better yet, write us, as much of what we do is done because someone asks a question or volunteers information!